Yes, you heard me: screw budgeting. Toss those budgeting envelopes in the trash before heading to the thrift store. Don’t get me wrong– managing your money is awesome–and necessary! You gotta pay bills, right?? But when it comes to thrift stores, everything you learned about budgeting and impulse buying is no longer applicable! 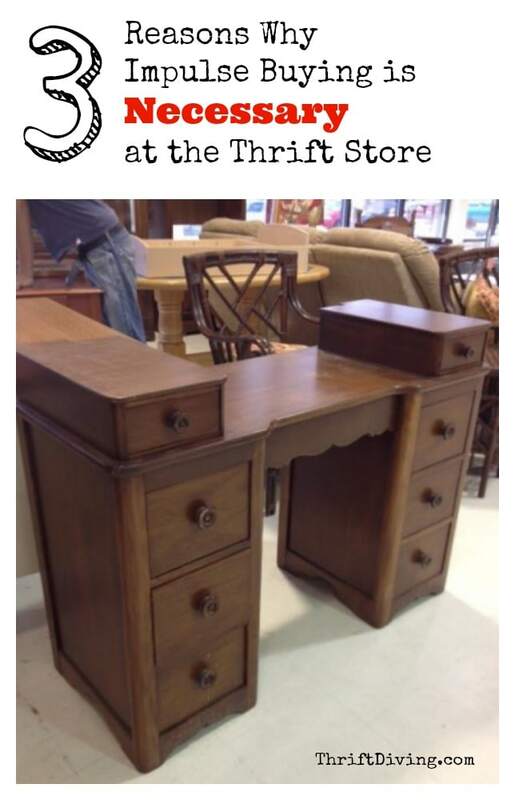 Try this test the next time you see something you love at the thrift store: try walking away. If you physically cannot do it (okay, you might have serious issues if you literally physically cannot walk away, LOL), you must buy it. But I bet you won’t even want to move to the end of the aisle, for fear that some other thrift diver is going to swoop up your perfect score. If you feel that way, then you must buy it. You’d hate yourself later for losing it. And you’ll lament for years to come about how you found “THE” perfect ____[fill in the blank]____ but you let it get away. It won’t be there tomorrow. This isn’t Macy’s, you guys. There aren’t 100 more back in the stock room just waiting for you to save up….or decide if you really want it. There’s (usually) only one of something (although I was lucky as hell to find two matching of the coolest lampshades EVER, but that rarely happens). So, if you see something that’s amazing, odds are, someone else thinks it’s pretty amazing, too. Buy it. It won’t be there tomorrow. What do YOU guys think? Agree or disagree? Was there something you didn’t buy at the thrift store, but lived to regret it? « What’s the Purpose of a Formal Living Room, Anyway?